This work will draw upon the expertise of the editors as authors and various contributors in order to present several different perspectives with the goal of approaching and understanding when ethical lines are crossed. In order to achieve this goal, comparisons of various canons of ethics from related fields such as medicine, law, the military, science and politics will be examined and applied. Case studies will be presented throughout to illustrate ethical dilemmas and challenge the reader with the goal of greater understanding. 1 Meta-Ethics: What does “Right” mean? 2 Normative Ethics: How Ought People to Act? 3 Applied Ethics: How do People Implement Moral Knowledge? 4 Moral Psychology: What do People Think about what is Right? 5 Descriptive Ethics: What do People Profess is Right? 5 Can Ethics be Taught? "Downs, a medical examiner and consultant, and Swienton, a forensic attorney and consultant, provide forensic and criminal justice practitioners, crime scene investigators and photographers, law enforcement training centers, police academies and local agencies, and forensic consultants and scientists with a guide to ethics in forensic science. 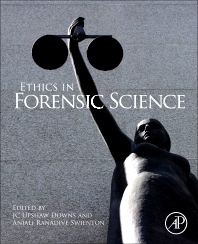 It contains 17 chapters by forensic science, law, and other specialists from the US who discuss the history of ethics, provide brief synopses of major theorists, and address topics like the religious perspective of applied ethics in forensics; general ethical dilemmas; codes of ethics in forensic science societies and other organizations (education, business, religion, medicine, etc. ); the Sexual Assault Nurse Examiner model; teaching ethics; criminal investigation, crime lab and crime scene, and judicial ethics; the post-conviction process; whistleblowers; and ethics in law enforcement, for child abuse prosecutors and defense attorneys, in testimony of forensic practitioners, and in media." --Reference and Research Book News, Inc.